USB-A Output: DC 5V/2.4A, Works with most of the USB devices, like iPhone, iPad, Tablet, GPS or other standard USB devices. Made from fireproof materials for your safety. Vibration reliability for durable and the secure transfer of continuous power to your device from the cigarette lighter plug. No effect on Radio, Bluetooth or Wi-Fi. 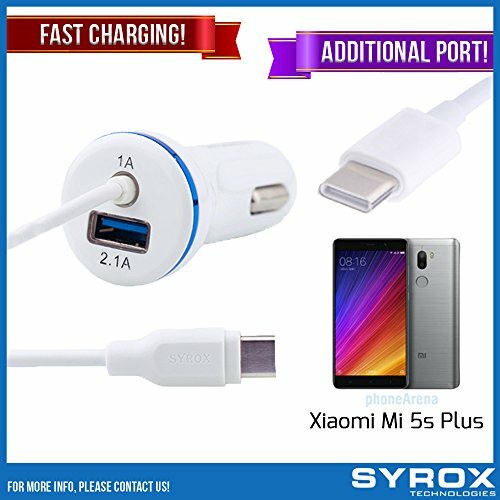 OEM Syrox 3.1A Fast USB Type-C Charging and Additional USB Port for Android, iOS, Windows more Car Using with Full Money Refund Guarantee. Do not forgive check our feedbacks! EXTREME DURABILITY: With a tested 10000+ bend lifespan, the cables are more durable, wear-resistant and pull-resistant. Even the cables is easy to sort out, not to knot or tangle. WHAT YOU GET: A Quick Car Charger Type C Cable and Additional 3.1A USB Port. Durable design which makes it easily survive everyday usage and gives it a more stylish & elegant appearance that goes great with your expensive gadgets. 2-YEARS WARRANTY: We take care of all quality-related issues with a REPLACEMENT or REFUND. Please contact with us if you got the defective item, we will fix your issue within 24 hours. If you have any questions about this product by Syrox, contact us by completing and submitting the form below. If you are looking for a specif part number, please include it with your message.